If you're in the market for work holding devices, a lot of woodcarvers, and indeed many of our Woodcarving authors, recommend the WDS Spencer Franklin clamps. In fact we have the SF-1310M PowRlock at the workshop, and it happily deals with the bulk of our work holding needs. But there are times when you need to hold, say a tracery panel, directly onto the bench, in order to carry out relief work. There are several ways of doing this, with WDS throwing their version into the mix with their series of toggle clamps - and with 25 to choose from covering various sizes for horizontal and vertical positioning, you should find something suited to your needs. We called in a few to test across our woodworking titles as their application is varied, but particularly suited to carvers of relief work. Made from steel which is then zinc plated, these little toggles look intriguing, and you find yourself spending several minutes just picking them up to feel and study them. In fact, when you line them up together on the bench, they almost resemble little creatures, such as you would expect to find in the latest animated films! in a controlled manner, and they look the part. I wanted to have a go at securing a relief panel to one of the workshop benches, and one of the horizontal toggle clamps would be just the ticket. To secure the toggle itself, you screw it down onto your work surface, which provides plenty of resistance to movement. As I didnâ€™t want to screw holes directly into the benchtop, I screwed it in this instance, onto a carving board. Once done, position your work underneath the rubber bolt cover - essential for protecting against unwanted marks - and pull the lever down to fasten your work to the surface. Job done! 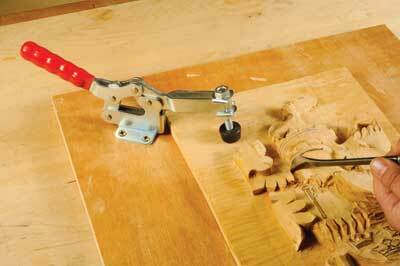 Depending on how big your workpiece is, you may want to use 2-3 clamps spread around the carving. I spent a good while carving away with gouges, knives, and even a power carver at one point, and the work stayed firmly in place, without any play. Not bad at all! When you're done, simply push the lever back up, which releases the pressure point of the clamp, and either unscrew the clamp, or leave in position as a permanent work holding device on the benchtop. 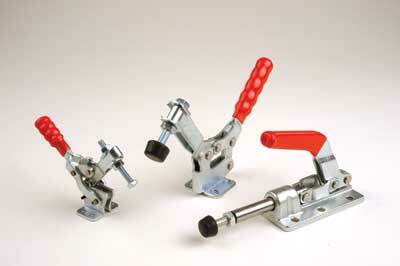 For something so small, these toggle clamps are deceptively very strong and will secure your work with confidence. I think they are marvellous and are a worthy addition to the WDS stable of good quality holding devices.